Graeme Stewart Elementary School is like a giant Sequoya with extensive roots in a forest newly filled with invasive species — a newly built Target store, condo developments, and a recently remodeled BMO Harris Bank. Situated in Uptown, which has been a battleground on issues of gentrification for the last 50 years, this 110-year-old historic landmark sits surrounded by green space. Mayor Emanuel and Alderman Cappleman would love to see this prime real estate (oops, I mean “underutilized” school) be used for something more profitable than educating low-income children from the neighborhood. Unfortunately, Stewart Elementary is in the wrong place at the wrong time. It has been slated to close at the end of this school year as the City makes plans to move the 256 students (98.1% of whom are low income) to Brenneman school, which is faring no better even though CPS has promised that displaced students from “low performing” schools will be moved only to higher performing schools. Stewart serves a diverse student body : 50.4% of the students are Black, while Latinos make up 40.5%; 18.7% of students qualify for Special Education services, and 35.5% are English Language Learners (ELL). A well-developed music and theater program headed by Reggie Spears, who has been an outspoken advocate for the school. It even has its own dedicated website. Last fall the school put on a production of The Wiz. 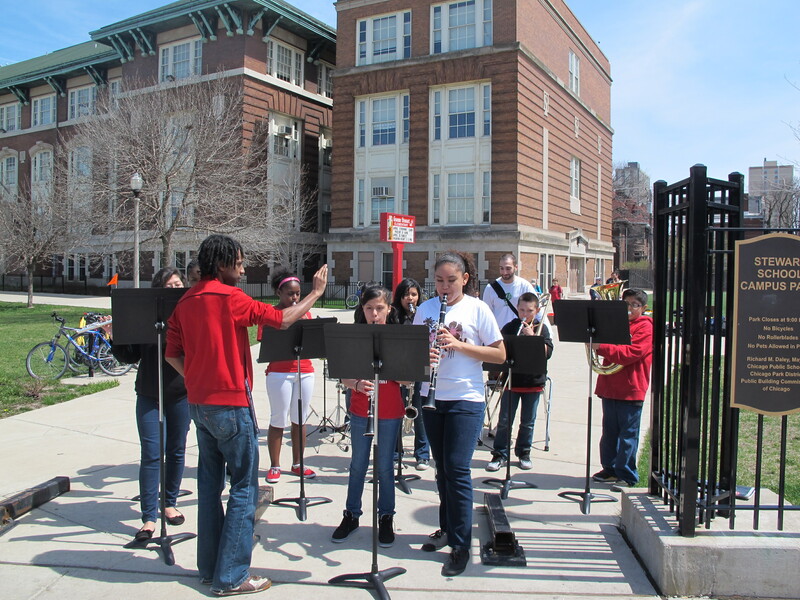 There are band and guitar programs as well as talent shows organized by the music teacher. A program for autistic children, which uses two classrooms at the school, one for younger-aged children and one for older students. The teacher for the younger kids has a long history at Stewart and doesn’t know if she’ll be able to move with these students. This is a tragedy since it will be extremely difficult for these children to transition to a new school without a familiar face. Several extra-curricular activities, including a running program for girls and a before-school Tai Kwon Do program. Headstart and full day kindergarten. Close ties with social service agencies and after-school programs that serve the needs of the large immigrant population at the school. Heartland Alliance provides social work services to many of the immigrant and refugee families at the school. Christopher House has a location near the school and provides after-school care for many students. An after-school program across the street from Stewart supports African immigrants. Although CPS branded this school “underutilized,” there is only one room in the school that is not being used by students every day. This room is being used as storage for classroom furniture and supplies. Apparently CPS believes every classroom should have wall-to-wall children and the supplies should be stored in the ceiling panels. The other classrooms that CPS has decided don’t count in their utilization formula are being used for: the speech and occupational therapist, the social worker, ESL pull-out and RTI, Special Education, the Bilingual Lead Teacher, a parent resource room, a book room for guided reading books, the principal’s office/meeting space. These support teachers are just as important as the homeroom teacher in running a school. Although the school is on the chopping block, the Stewart community refuses to accept this decision; they will continue to fight for its survival. 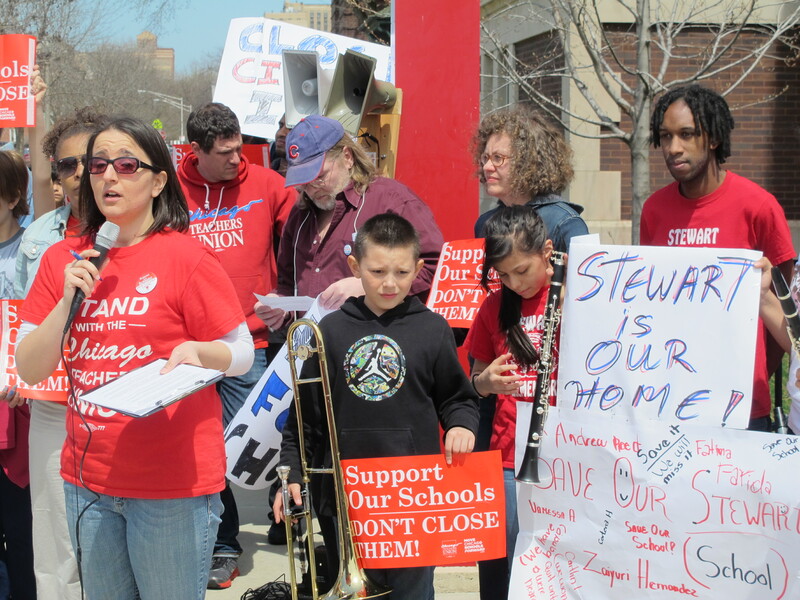 About 150 parents, students, teachers and community members gathered on April 28th to oppose CPS’s decision to close the school. The school’s band, directed by Reggie Spears, proudly displayed the school’s spirit by playing “Eye of the Tiger” toward the busy intersection as if to say, “This is who we are and we’re not going to roll over and play dead.” According to an article on the website DNAinfo.com, Mr. Spears said that none of his band members want to go. “You can see them standing on the front lines to fight it right now.” The welcoming school already has a music teacher, so the incredibly talented Spears will be out of a job. In an unexpected turn of events, hearing officers (many of them retired state and federal judges) who had been hired by CPS to oversee the school closings process recommended against closing Stewart and a dozen other schools on the proposed list of 54. According to teacher and student responses on the My Voice, My Schools 5Essentials Survey, Stewart scored high points in the areas of ambitious instruction and supportive environment. Well … unless that community gets in the way of gentrification in the Uptown neighborhood.